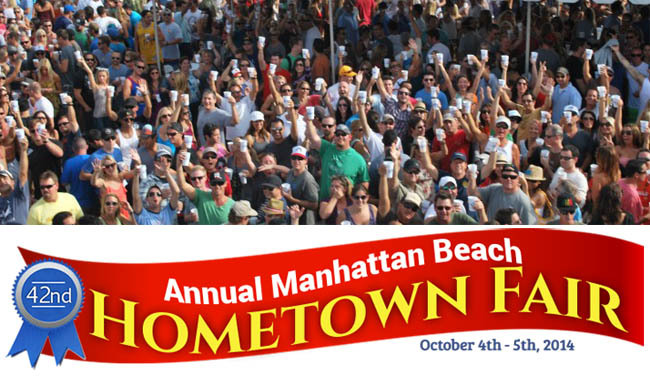 The 42nd Annual Manhattan Beach Hometown Fair is in town this weekend! It’s come a long way since the first parade down Manhattan Beach Boulevard and the few vendors and games it had in 1972. In those days it was known as the “Old” Hometown Fair and, although the word “old” has been dropped, there are still old-time fair traditions that stand to this day. One long-standing tradition is the parade that kicks off the weekend celebration. This year it starts at 10 a.m. on Saturday and ends at South Stage, in front of the Scout House. The Mira Costa High School Marching Band leads the parade and you’ll also get to see the many cool antique cars that turn out for it every year. The fair still celebrates our Manhattan Beach artists, as well, and there will be displays of local artwork at the Joslyn Center. Kid Country is back again this year and the little ones can take a pony ride, pet the animals at the petting zoo, bounce to their hearts content in two different bounce houses and ride the 50-foot slide. Also in Kid Country this year are two shows, a wild animal show and a magic show. The free games this year sound like a lot of fun for the kids, although the paid games do benefit charity. Free games include a water balloon toss, 3-legged race, egg toss and more. We really like the Diaper Derby and the Toddler Trot races. Ah, fair food! Hot dogs, hamburgers, pizza, tacos, teriyaki bowls, tri-tip and more. Wash it all down with a libation from the beer or wine garden or a long list of non-alcoholic beverages. For desert, funnel cakes are back, or you can munch on brownies, donuts or ice cream. Parking at the beach is always impossible, so if you are driving to the fair, your best bet is to take advantage of the free parking at the Northrop Grumman lot on Aviation on the west side of the street. From there, a shuttle will take you to the fair (it’s free too). Shuttles run from 7:30 a.m. to 6:30 p.m. on Saturday and 8:00 a.m. to 6:30 p.m. on Sunday. They run about every 15 minutes throughout the day. If you ride a bike to the fair you can leave it at the free valet in the Joslyn Center parking lot and, yes, there will be volunteers there to watch your bike. The Manhattan Beach Hometown Fair this year is on Saturday and Sunday, October 4th and 5th, on Valley Drive, between 15th and 21st streets. Come on out and show your community spirit.